I started riding bicycles seriously in 1994 when I started my first law job as a Multnomah County Deputy District Attorney. I wish I could say it was solely because of the joy of riding, but it started out as an economic decision. I did not make much money and parking, gas, insurance, etc. were eating up a big chunk of my paycheck. I first started by hauling my mountain bike to Lake Oswego and riding in from there. After a few months of riding, I got the bike bug bad and made the decision to sell my car and buy a road bike. Around 1995 I started commuting full time from West Linn to the courthouse, which was a little over 20 miles each way with almost 1,000 feet of climbing. Pretty soon I was commuting 5 days a week and riding every weekend. I ended up moving to Portland in 1996 and my commute was only a few miles and I really missed the long miles, so a buddy suggested I start bike racing. Bicycle racing soon became, besides trying cases, the main focus in my life. I trained around 30 hours a week and rode many thousands of miles a year. Before long, I joined a team and started doing stage races as well as cyclocross. I ended up racing for Presto Velo for a number of years and eventually became their main cash sponsor (bicycleattorney.com/racing). Eddy Merckx and Mario Cipollini were my heroes and I was such a geek that I named my dog Cipo. I eventually burnt out on racing around 2002 and went back to being a bicycle commuter. I started my personal injury law practice at the end of 2002. When I opened my doors, I started getting calls from cyclists who knew me and pretty quickly my practice evolved into a bicycle practice. 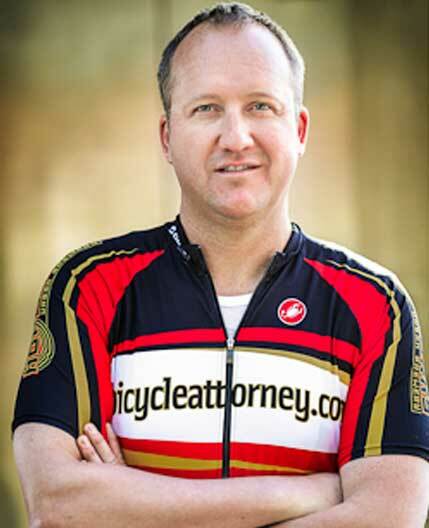 I still do a number of motor vehicle cases, but the bulk of my practice is cycling cases. Although I am no longer a super fit bicycle racer, cycling is still a big part of my life. The first thing I do when I wake up is to check Velo and Cyclingnews.com and see what is happening in the world of bicycle racing. I bought a house on Skyline because I wanted to ride in the hills and to be able to commute on Leif Erickson. I rarely ride my race bike on the road anymore, but I spend a lot of time on my cross bike riding up and down Leif Erickson commuting and just having fun. When I am stressed out or having a bad day, I hop on my bike for an hour or two and it all goes away. I do my best thinking on my bike and when I am done I always feel better and I can't wait for the next ride. This is why I ride and will never stop riding.